Scoliosis occurs when your spine takes on a side-to-side curvature rather than following a straight up-and-down alignment. Scoliosis often becomes apparent during childhood or adolescence but may also show up in adulthood. The University of California Davis reports that scoliosis affects 2 percent of the general population, with a higher incidence in females than in males. Scoliosis may range from a mild curvature that needs no treatment to a severe abnormality that may require bracing or spinal surgery. Exercises may help in managing or, to some degree, reversing the effects of scoliosis. However, consult with your health care provider for the best way to treat your scoliosis. Strengthen your core muscles. These muscles include not only your front abdominals but also your side abdominals, or obliques, and the muscles of your low back. Building strength throughout your core helps keep your torso in proper alignment and may help relieve back pain associated with scoliosis, according to the University of Washington Department of Orthopaedics and Sports Medicine. Core strengthening exercises include planks, crunches and supermans. Practice yoga poses, especially those that focus on your spine. Yoga postures help align your entire body as well as provide strength and flexibility to the musculature supporting your back, states Iyengar yoga instructor and California Yoga Center director Elise Miller. Extended puppy pose, for example, stretches and elongates your spine, helping to decompress your vertebrae. Twisting poses, such as triangle or chair twist, allow your body to move opposite the curve caused by your scoliosis, helping to realign and balance your torso. Backbending poses not only strengthen your core muscles but also help counteract misalignments in your spine. Stretch the muscles of your lower body. The muscular imbalance due to scoliosis often results in tight hamstring muscles, and tight hamstring muscles may cause a further shift in your posture. 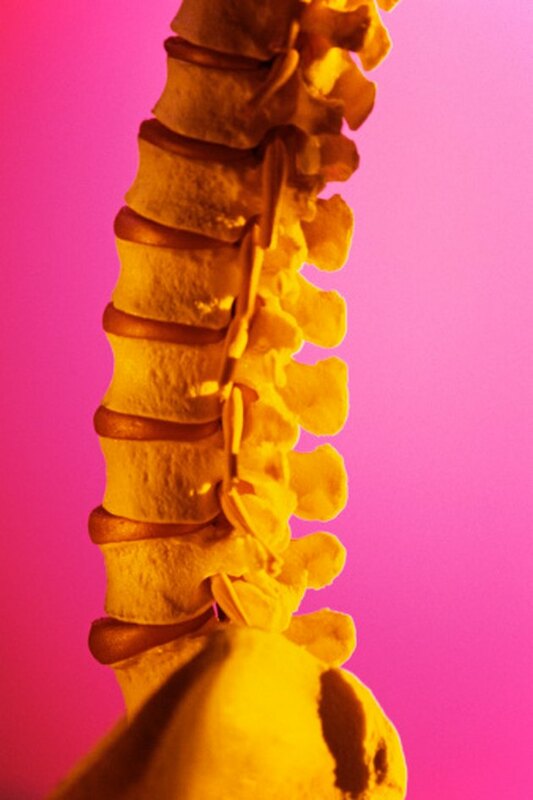 Additionally, a misaligned spine may lead to compressed nerves in your back or lower extremities, causing pain. Exercises to stretch your back and leg muscles help relieve this discomfort. Stretching exercises also help restore flexibility to your lower body, allowing your posture to improve. Yoga postures, such as reclining heel-to-toe pose, and forward bends focus on stretching the muscles of your legs and back. Stretch your pectorals, or chest muscles. Stretching these muscles is especially helpful if you have kyphosis, or hunched shoulders. This condition may occur when you have an imbalance between the muscles of your chest and upper back. Reclining backbends or passive resistance, in which you use a wall or a partner to stretch your arms behind you, stretches your pectoral muscles and helps restore muscular balance to your upper body. Exercise consistently to maintain your muscular strength. Consume a healthy diet with sufficient calcium and vitamin D to help prevent osteoporosis. Maintain a healthy weight to minimize back strain. Avoid exercises that cause you pain. Report any new or worsening pain to your health care provider. University of California Davis: What Is Scoliosis?